Chronic pain can occur as a result of a car, truck, motorcycle, bicycle, slip and fal, boating accidents, or any other traumatic injury or event. Chronic pain is always difficult to prove, because unlike broken bones, chronic pain does not show up on an x-ray or a scan. Chronic pain is a subjective pain complaint. Only to complainant or accident victim truly understands the nature of the pain, and how it impairs the person's activities of daily living. Chronic pain is also seen in a number of long term disability claims and insurance disputes involving the entitlement to long term disability or private disability benefits. Insurance companies are very skeptical to awarding compensation to chronic pain victims. Goldfinger Law works with the best doctors, specialists and pain specialists and rehabilitation specialists to get you top dollar for your personal injury claim in a chronic pain case. We take a multi disciplinary approach to chronic pain cases. No single expert or doctor will have definitive answer for these cases because chronic pain encompasses so many areas of the body and the mind. These cases may involve radiating back pain, shoulder pain, neck pain, headaches, depression, fatigue, anxiety, sleep disorders, concentration problems or a loss of memory. Goldfinger Law is empathetic towards all of its chronic pain clients. We understand that our clients lives have been turned upside down on account of pain which doctors have a hard time understanding, treating and explaining. We have seen countless chronic pain clients and have helped them bring dignity back to their lives. We have helped people just like you get out of their personal ruts and restore a sense of pride after completing their legal cases. We have shown insurers and Courts that chronic pain is a very real problem which can take somebody's life hostage. We have succeeded in recovering money on behalf of fibromyalgia claimants for their long term disability claims or their car accident claims. If you are a victim of chronic pain and believe that you have legal claim for compensation, contact the lawyer who understand chronic pain cases the best. Contact Goldfinger Law today for your free, no hassle consultation with a personal injury lawyer. You have nothing to lose, and everything to gain. If you cannot attend at one of our offices, we would be pleased to visit you at home or in hospital depending on your circumstances. 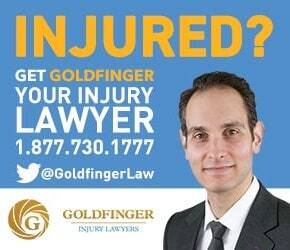 You can reach Goldfinger Injury Lawyers locally at 416-730-1777, toll free at 1-877-730-1777 or by email at info@goldfingerlaw.com. 5.0 "Brian did an amazing job"